I read this article and found it very interesting, thought it might be something for you. The article is called What to Keep When Someone Dies and is located at http://modernloss.com/what-to-keep-when-someone-dies/. When my father died unexpectedly five years ago, I found myself faced with the daunting task of sorting through his entire home and deciding what to keep. As a professional home organizer, I coach my clients and friends on how to make these decisions all the time. I have the tools and the training to edit and organize any space, but tackling a project of this magnitude, compounded with the grief and shock over the sudden loss of my Dad, is not something I ever could have prepared for. Here’s what helps. Deciding what to keep when a loved one dies can be incredibly overwhelming and emotional. Call on a little help from trusted friends or family members. Most people want to help but simply don’t know how. You can enlist your community to help with everything from dropping off snacks or supplies to helping with childcare so you can dedicate your full attention to the task ahead. Even if they simply sit by your side and provide moral support, this is not a task anyone should have to tackle solo. I had a good friend offer to help me navigate through my father’s belongings just a few weeks after he died. She was able to be both completely supportive and totally neutral when it came to decision making, and I will never forget how much her presence meant to me. Before trying to make any specific decisions, plan to take a walkthrough of the space so you can get a sense of the size and scale of your project. How many rooms will you need to sort through? Will you need to plan an estate sale or coordinate donations? Are other family members going to help? What supplies will you need (storage or donation boxes, durable garbage bags, sticker labels, sharpies, and post-its will help you stay organized throughout the project)? Make sure to create a timeframe so you can make a plan and map out enough time on your calendar. Working in 3-4 hour blocks of time followed by some well-deserved self-care is optimal. If you have to sort through an entire home like I did, it may be helpful to do an initial sweep, intuitively picking the items that feel the most meaningful and sentimental to you. My friend, Amber, walked me through each room and suggested that I simply pick my favorites instead of overthinking. I found that I was able to pretty effortlessly identify the items that stuck out and resonated – my Dad’s trail maps, his photographs from the Peace Corps, his handwritten letters, and his treasured recipe book. The whole process only took about an hour and helped me feel much less overwhelmed. Make sure to pace yourself and work in small increments so you can keep your energy up and stay focused. You may find it easier to sort by category — i.e books, music, clothing or appliances so you can assess each category and select the most meaningful and precious from each group. When my father died he had a spacious three-bedroom home with plenty of storage. At the time I was living in a small two bedroom apartment with limited storage space. I was forced to be practical and remind myself that just because something belonged to my Dad, I didn’t have to assign it special meaning or keep it. I focused on only keeping the items that felt personal, meaningful, and irreplaceable, like photos, journals, and letters. Remember, you can always take a photo of something if you don’t have the room or the inclination to keep it. Be realistic about your own storage constraints, and decide ahead of time what volume of stuff is realistic for you to take possession of, care for, and store. Try purchasing a set quantity of storage bins that feels reasonable and will fit comfortably in your own space. This constraint will help limit your choices and eliminate decision fatigue. In my case, I bought six weatherproof bins and focused on choosing thoughtfully since my space was limited. With few exceptions, basements, attics, and garages tend to feel like “stuff graveyards” to me. 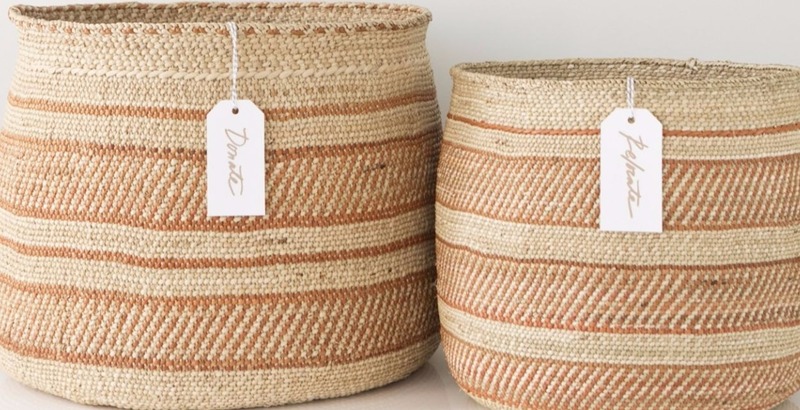 I believe in keeping things you can actively use, appreciate, and integrate into your home, not just stow away to collect cobwebs in a dusty storage space. I also believe that the less you keep the more meaningful it becomes. I had a client once who had ten different sets of her families china all boxed up in the basement. I helped her to create a curated collection that she treasures, consisting of one piece from each set that she now displays in her dining room. The rest was donated to charity to people who will actually need and use it. If you are charged with sorting through a loved one’s possessions, make sure to check in with any friends or family before you sell or donate anything. Since all of my father’s family was in NYC and we live in California, I made sure to call them to see what might be meaningful for them to keep. I was so glad I did because items that did not mean much to me are now treasured by his East coast friends and family. Most likely, you will end up with furniture and other belongings that need a new home. Once you’ve taken what you (and other friends and family) want to claim, you should set up a plan for the rest. Options include coordinating a charitable donation drop with a local charity, paying for a donation pick-up with a third party, or holding an estate sale. In my case, since I was doing everything solo, the easiest solution for me was to hire a third party to hold an estate sale. Estate companies typically do all of the work and will even donate unclaimed items. This service was such a gift at a time when I was still grieving and overwhelmed with other important to-dos. This is a complicated process and there is no right or perfect way to do it. Be kind to yourself, and do your best to banish unproductive feelings of guilt or obligation. Do your best to keep items that have positive associations and make you feel good. Guilt never got anyone anywhere. In the end, it’s up to you to decide what feels important and meaningful. Shira Gill probably thinks you have too much stuff. Visit her at Shira Gill Home for resources and inspiration to help you design a clutter-free life. A version of this piece appeared on shiragill.com.